Brothers Anand and Milind Shrivastav will be familiar to longtime followers of MFT3F for 1990's slightly over-the-top but very entertaining 'Jungle Love'. The sons of veteran music director Chitragupta, they've scored as many as 200 films, of which 'Peechha Karro' is one of the earliest. Its title track is what brought my attention to this soundtrack, via a tip on Twitter from film director Atul Sabharwal. Sung by Sharon Prabhakar, it's a gloriously catchy new wave-reggae funk-pop tune that immediately got stuck in my head. Almost as good and equally infectious is the boisterous disco stomper 'Rama Rama'; combined these two are enough to make it a worthwhile album. 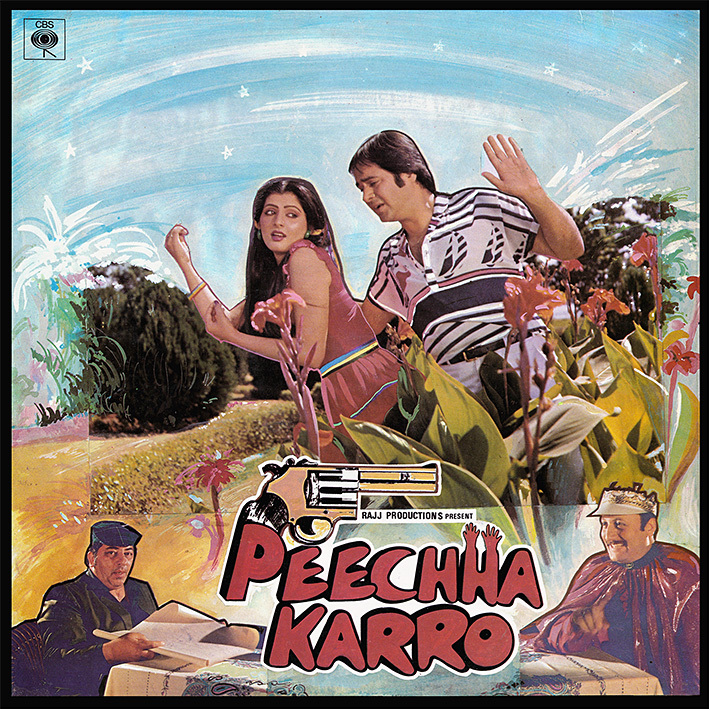 The remaining songs are more conventional and fail to interest me as much: 'Tumhe Murga Banaake Khilaoongi' contains a pleasant enough melody and 'Mujhpe Goli Na Chala' has an electro intro and some funky bits in-between. And for some reason half the tracks have alternate titles in the YouTube clips. Thanks a lot for the rare album of this film which was not easy to find before it was officially uploaded on youtube. If you come across Anand Milind's best or the most popular work (Dil/Beta/Anari/Vansh), the 'real' composer for most of the songs of these titles was Illayaraja. Yes, they lifted his tunes. Hence, I'm inclined to ask whether their good tunes were provided by their underrated father or not.That is what the so called critics say about RD Burman and Anu Malik, so why not include Anand Milind and Rajesh Roshan too in such composers list. Now this is a real Rare stuff..thank you for this upload. Though i havent heard the songs yet ..im sure listening to such rare stuff would be a delight even if the songs are not the so called classics..